FLORENCE – South Carolina’s heat and humidity are threatening to destroy a mainstay on southern supper tables, but a Clemson researcher believes he can help save the traditional southern dish. Tony Melton, a Clemson Extension senior county agent, grows butterbeans in greenhouses at the Pee Dee REC as part of a heat-tolerance study. Butterbeans, also known as lima beans, have been served up on South Carolina plates for more than 100 years. These beans come in speckled and white varieties. Speckled butterbeans are considered by many to be the “Jewels of the South,” but high temperatures seem to be taking away their shine. Tony Melton, Clemson Extension senior county agent, is conducting research at Clemson’s Pee Dee Research and Education Center (REC) to develop a butterbean variety that can flourish in the South Carolina heat. Butterbeans, like most beans, self-pollinate. This means flowers on a bean plant pollinate before they open. Jackson Wonder is the speckled butterbean variety most common in South Carolina. Hot temperatures are ideal for plant growth, but problems start when night temperatures rise above 75 degrees. Melton said he hopes to have a heat-tolerant butterbean variety by the end of this year (2019). Melton’s butterbean breeding effort is part of an emphasis by Clemson agricultural researchers to develop crops optimized for South Carolina growing conditions. Butterbeans have been on a steady decline in South Carolina. United States Department Service of Agriculture National Agricultural Statistics Service (USDA-NASS) takes a census of agriculture every 5 years. The 2007 Census shows 798 acres of butterbeans were planted in South Carolina. 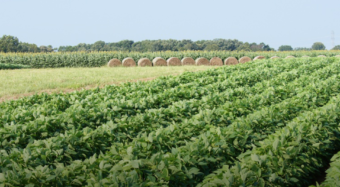 The 2012 Census shows 261 acres of butterbeans were planted in the state. The 2017 Census is expected to be released in April, but some growers don’t believe the numbers will be higher for butterbeans. Gowdy planted 160 acres of butterbeans in 2018 but is going with just 60 acres in 2019. This graphic shows how South Carolina temperatures have been increasing over the past 100 years. Butterbeans are planted in both spring and fall. South Carolina has three gardening regions – Piedmont, Central and Coastal. Depending on the region, butterbeans are planted in South Carolina from about March 20 through May 15 and from July 1 through August 10. In addition, the report states the number of severe droughts could increase and result in crop failures. Higher temperatures also are likely to reduce livestock productivity because heat stress disrupts the animals’ metabolism.